More beautiful than a baby bjorn. More practical than a hotsling. 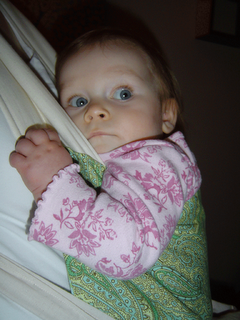 I always envied those hands-free, sling wearing mamas. I found the mei tai on craigslist and thought we'd give it a try. You can tell a lot about how I'm doing by the state of my hardwood. Dustbunnies, outdoor bits and little pieces of Monkey were all over the place. This morning, I snuggled Claire in and got some serious cleaning done. You can't tell from the photo, but she really seemed comfortable in there. This alone made the soggy week much more bearable.